If you’re still calling the parking space closest to the store with the blue signs “handicapped parking” then you are behind the times. The word handicapped oozes incapability and disadvantage. Here’s your know better moment: Refer to those spaces as Accessible Parking. Using the word accessible makes it about the parking accommodating a person’s needs, not about the strengths or weaknesses of a person who experiences a disability. Accessible parking can be used for people who have short-term or long-term accessibility needs. If you’re in a car accident and are recovering from a broken leg…Boom! With the right DMV form and a doctor’s note, accessible parking could be an option for you. If you have multiple sclerosis and walking long distances is difficult for you…Boom! With the right DMV form and a doctor’s note, accessible parking could be an option for you. If you use a power wheelchair to get around…Boom! With the right DMV form and a doctor’s note, accessible parking could be an option for you. If you live in Virginia here’s more information about the DMV form: https://www.dmv.virginia.gov/webdoc/pdf/med10.pdf. We’re going to take this a step further— not all accessible parking is equal. I had an experience recently at the DMV with my friend Roland. Roland uses a power chair to get around. He needs wheelchair accessible transportation to get where he is going. Roland needed to go to the DMV (exciting place, I know) so he and I headed out. Roland uses special accessible parking called Van Accessible Parking. This parking gives an 8-foot space between its neighboring car to allow room for ramps and space for folks who use wheelchairs to navigate around. When Roland & I arrived at the DMV a person who needed accessible parking was parked in the van accessible parking. Already the DMV is notorious for waiting. Imagine if you had to begin your DMV adventure with waiting for the only parking space that was accessible to you and that one parking space was being taken by someone who didn’t need van accessible parking. Roland is flexible, patient, and understanding. I could learn a lesson from that guy. We ended up having to park at the very end of the parking lot, hoping that no one would park beside the van. Getting to the front door of the DMV was hard. The accessible part of the sidewalk (the part you don’t have to step up to access) was on the other side of the parking lot, closest to the accessible parking spaces. So Roland and I had to twist and turn through the parking lot trying to find the easiest way to get to the front door. This problem could have easily been fixed if Roland was able to park in a space that meets his accessibility needs–a van accessible parking space. The problem is, these spaces are pretty limited. 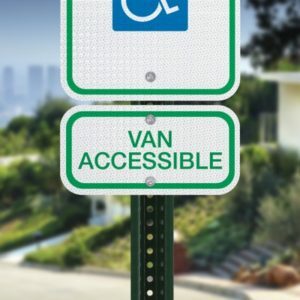 In most parking lots, there is only one van accessible parking spot. The only noticeable difference between an accessible parking spot and a van accessible parking spot is a small sign that says “van accessible” and an 8ft wide crosswalk. If you or someone you support uses accessible parking, think about the needs of people who use a wheelchair to move about and depend on van accessible parking before pulling into that space. Let’s think of others while meeting our own needs.